The only servers in my stack are the sensors themselves. I bought an old house and I want to start fixing things. It helps that I’m a bit of a nerd and this is a great excuse to learn about electronics. Before I knew it I had a raspberry in every room of my house and I started collecting my own data. For this problem, I chose to go with the rapsberry pi stack with sensors from pimoroni. I cannot recommend the pimoroni people enough if you’re interested in working with python. They offer a garden hat which is a solverless solution to attach sensors to a raspberry. The sensors themselves come with packages that are installable from pypi which is great! The main problem though has to do with updating. I want the raspberries to post data somewhere (BigQuery) and if the endpoint changes I’d prefer that I do not need to manually update via USB. After thinking about what I wanted the stack to look like I considered that the raspberries themselves act as if they are servers so I could go ahead and use ansible for it. It is an old tool, I remember we’ve used it to provision hadoop clusters 5 years ago, but it has all the features that I needed. The only manual thing that you need to do is put an identity file on each raspberry and allow ssh traffic on each device. From there you can do a lot of things programmatically if you configure the right files. Note that the names of the servers need to correspond with those in the config file and from here you can split up functionality per server. I have certain raspberries that have completely different sensors and you can split this from the hosts file. The remaining .yml files contain instructions for the raspberry which are picked up and are run in parallel. Here’s an example .yml file that installs some required software. The command might differ depending on the OS. Note that pypi is available via ansible! Here’s an example .yml file that sets a cronjob. Note that you need to remove any old cronjobs before adding new ones. Also note this won’t run for all hosts. This will update any raspberry connected to wifi. I was considering installing a raspberry outside with solar panels and everything. I’ll still do this someday, but hardware takes more time than software and you cannot copy/paste in real life. So instead of measuring the weather outside of my house, I figured scraping the weather APIs would be a much better idea. It was. Adding to my stack was super easy. Google now has a cloud-cron service which allows you to have a serverless function called every minute. Per day I log about. I’ve been running this for about 3 months. This totals to about 150MB of data, with a dumb schema. That’s 600MB per year. Sure, this amount will increase, but it takes a while before I start paying more than $1. There is a free tier on google’s side, which suggests I don’t pay for the first TB each month. 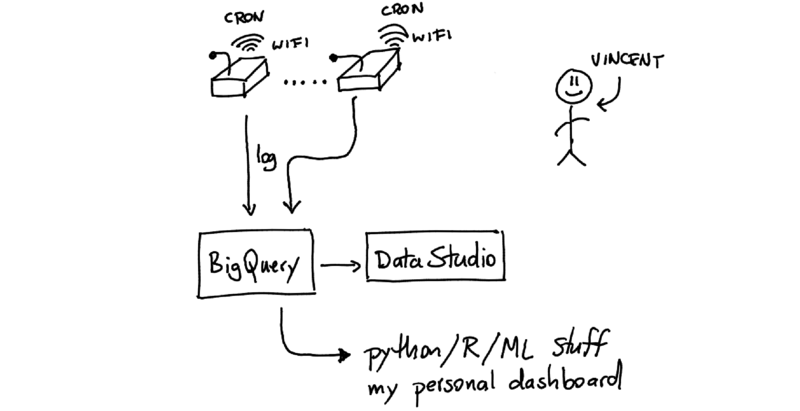 BigQuery is really easy to access from R thanks to bigrquery. 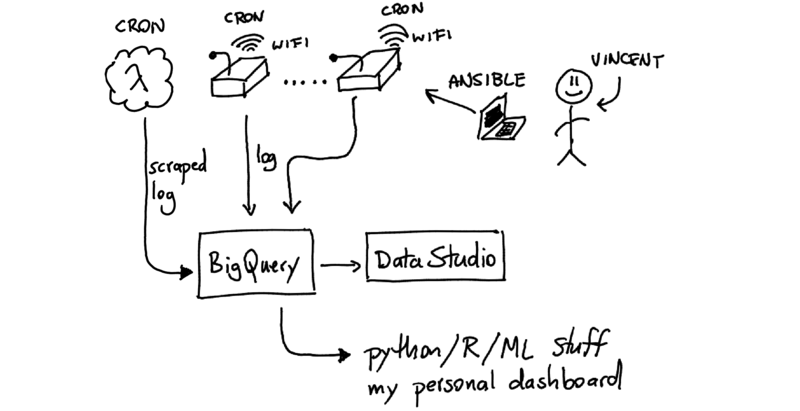 Setting up a dashboard locally took about half an hour and I can make all the charts that I desire from ggplot. It’s fun to measure one’s house like this and it helps to motivate some investments too. If you’re going to do this yourself; the heat from the raspberry influences the temperature/humidity sensor. So does sunlight! Either do some hardware work and move the sensors away from the raspberry if you want to get accurate readings or consider physics. Either way, consider that sensors are always biased. I haven’t fully figured out a good way around it just yet. The hardware can also get expensive if you want to have one such sensor per room in your house. I also think it is worth mentioning that most investments I’ve made to the house don’t really require the measurements. Adding a curtain in front of a leaky door makes for less heatloss and you do not need automated measuring tools in order to do this right away. Still, electronics can be a fun hobby. The real heros of this story are raspberry/pimoroni when it comes to hardware and python/linux when it comes to software. I couldn’t imagine just doing this 10 years ago and we’ve come a long way.